I was so looking forward to the Hope Diamond Barbie. I loved the promo pictures of the red haired siren with the gorgeous 20’s inspired gown and jewelry. I received her a couple of weeks ago and must say..I was underwhelmed. I adore the gown and jewelry. The doll…Meh. I guess the biggest disappointment was her hair. It was nothing like the promo’s . In reality..it was a big hot mess. I am fairly confident with fixing doll hair. This…was beyond my expertise. I am hoping that it was just my doll who had bad hair and that others received dolls with better hair. Pictures from toy fair showed this lady with promo prefect hair. I did not receive one of those. So, time to make some lemonade out of this lemon. I chose to repurpose the gown and jewelry right away. The gown was a tight fit on an FR2 body but I managed to make it work….just barely. Set: My white shelves set at an angle. Statues I found at a small shop in Snohomish ( my favorite place to find props!). Background is a graduated black to white background and I added a black acrylic floor. I use this floor a lot because I adore the dramatic reflection it gives. There is a blue spot on the black background. It is a small portable LED light that produced a white/blue light so it has colored the black background blue. This entry was posted on February 20, 2012 by raberry65. 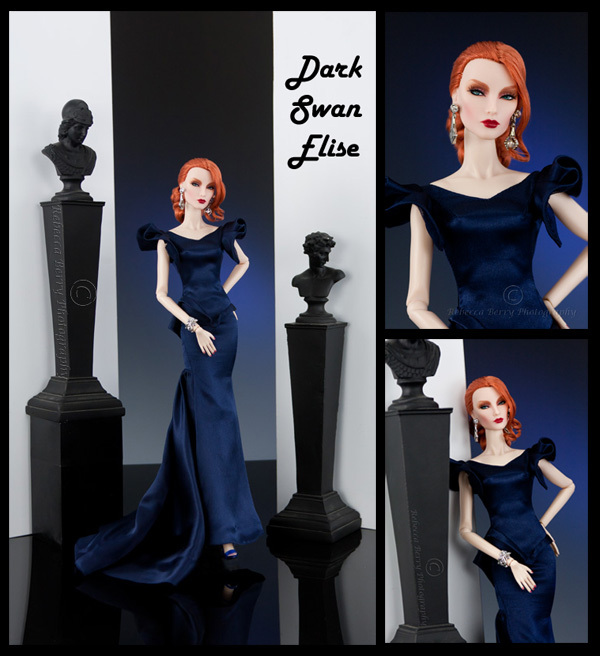 It was filed under Elise Jolie, Fashion Royalty, FR2 and was tagged with Doll Diorama, Doll Photography, Fashion Royalty, Fashion Royalty FR2 "Dark Swan" Elise, Hope Diamond Barbie, Rebecca Berry Photography. You make wonderful lemonade!!! Thanks for sharing!!! Just for the heck of it, let’s see the Hope Diamond Barbie and her messy hair. I guess I just keep envisioning someone saving their money for weeks and receiving a sub standard product. I feel as adult collectors we have a duty to return any product we feel is not up to the quality we are expecting or has been advertised. Perhaps if these companies received enough complaints they might take a closer look at their quality control. Great lemonade indeed! 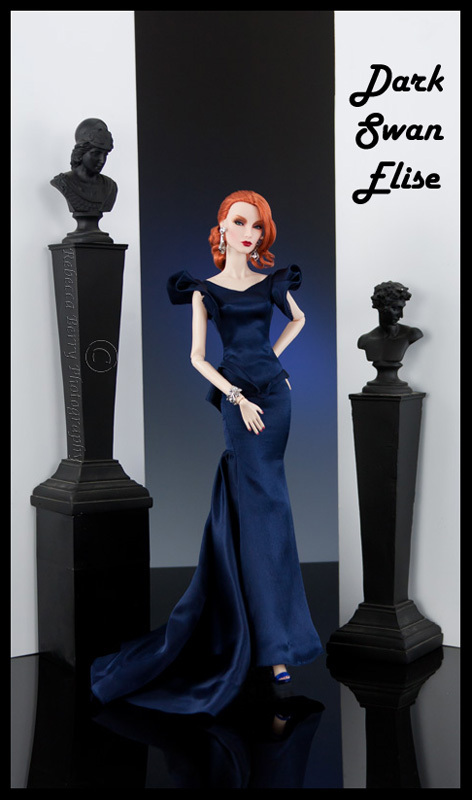 I’m sorry your Hope Diamond Barbie didn’t work out but her dress is stunning on Elise. Thank you so much ! As I stated in the post above….sometimes you win..sometimes you don’t. Life. Elise looks better in the gown anyway Heehee. Just lovely–this fashion is perfection on Elise! Thank you!! So glad you enjoyed the photos. I have to admit I was a little skeptical as I was putting the gown on her…thought it might make her look too pale. Once I put her in front of the camera I said, “Oh yeah!”. Love it when it works out that way. Gorgeous doll and great photos. Thanks for the details of how to photograph. Very helpful. Isn’t it sad when you look forward to a doll and you are disappointed. I received Grace Kelly in the Rear Window gown. Outfit is good, but the hair on the doll…..horrible. I can’t make myself take her out of the box. Thanks for your blog. I love it . Thank you so much Don and fellow Seattlite! Yes it is sad but then…that’s part of doll collecting for you. I can say that for every time I have been disappointed in a doll, I have had way more experiences where the promo shots have not done the doll justice and I am thrilled to pieces. I hear you about the Grace Kelly Rear Window experience. Many, many collectors had that experience. The dress again, was worth the cost though…I think. Thank you for the lovely comment about the blog. It is so great to hear that people are enjoying it. As a side note…went on a amazing food tour in Seattle( whitemoustache.com) last night and visited the most amazing restaurant…Cantinetta in Wallingford. If you like Italian food….TO DIE FOR! 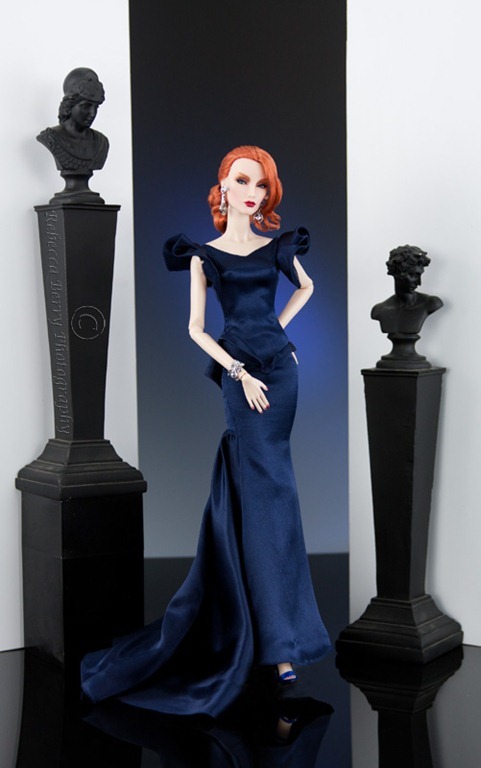 This dress is killer on Elise!I I would like too see the Hope Diamond Barbie as well. Thank you Debra! Will try and photograph the scary hair doll that is Hope Diamond but may be a while. Many other things I would rather photograph LOL! I love it when you tell us where you bought your props. Thank you. You are very welcome Diane. Thank you dear Matty! You just have to love a redhead in blue don’t ya? Yep…I think you do.